Banded iron formation: Mineral information, data and localities. Commonly termed BIFs by geologists, they are iron-rich rocks almost always of Precambrian age, predominantly associated with the great oxygenation event (GOE) about 2.3-2.8 billion years ago. It typically consists of repeated, thin iron oxide layers (a few mm to a few cm in thickness) but may be banded from a microscopic to a metre scale. The oxide bands are dark grey to to black magnetite (Fe3O4) or hematite (Fe2O3), alternating with bands of iron-poor shales and cherts, usually red in color, of similar thickness, or iron rich silicates and carbonates, including siderite, ankerite, riebeckite, stilpnomelane, minnesotaite, etc. They provide our major source of iron ore, usually after upgrading by various hypogene and supergene processes. [Jaspillite] Haddock, D. (1974) Diamond Drilling Programme IV. TC8 Prospect, E.L. 357 "Eldorado", Warramunga Goldfield, N.T. Aquitaine Australia Minerals Pty. Ltd.
[Jaspillite] Rust, S. (2018) Rocklands Presentation at the Westward Look Show, Tucson, Feb 2018. [Jaspillite] Ferguson, K.M. (1999) Lead, Zinc and Silver Deposits of Western Australia. 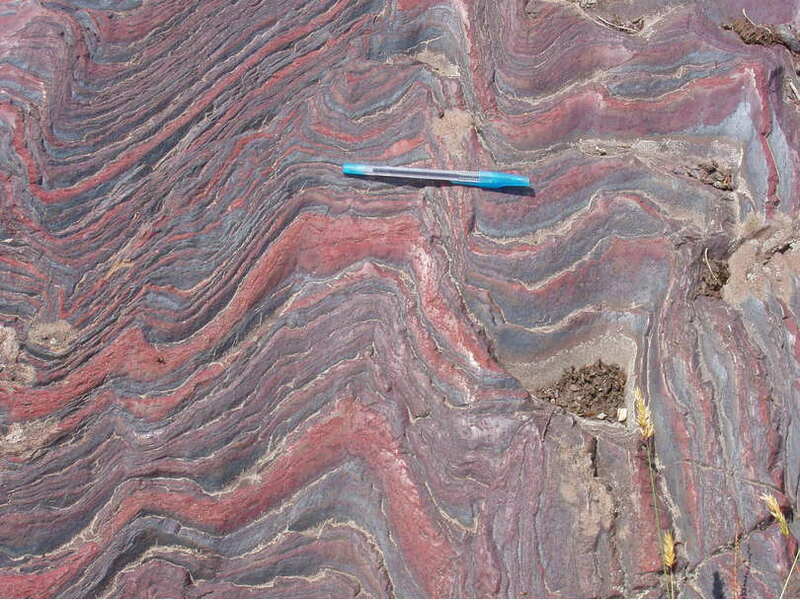 Geological Survey of Western Australia, Mineral Resources Bulletin 15. Coggon, J. H., Massey, S. G., & Amann, W. J. (1994). Magnetic and electrical signatures of the Granny Smith gold deposits, Western Australia. Exploration Geophysics, 25(3), 169-169. [Jaspillite] Boddington, T.D.M., (1990), Abra lead-silver-copper-gold deposit, in Hughes, F.E., ed., Geology of the mineral deposits of Australia and Papua New Guinea: Melbourne, The Australian Institute of Mining and Metallurgy Monograph 14, p. 659-664. Taylor, G. F. (1998). Mineralogical and Geochemical Studies of Gossan and Wall Rocks, Bottle Creek, Western Australia. CRC LEME. [Jaspillite] Balde, R., & Woolfe, T. I. (1990). Saint George gold deposit. Mount Magnet: In Geology of the Mineral Deposits of Australia and Papua New Guinea (Ed. FE Hughes), AusIMM, Mongraph, 14, 255-258. "Jack Hills Iron Ore Project, Australia". mining-technology.com. 2012. Retrieved 2013-06-10. [Jaspillite] Fetherstone et al 2013: Gemstones of WA; Fetherston, J. M., Stocklmayer, S. M. and Stocklmayer, V. C. (2013): Gemstones of Western Australia. Mineral Resources Bulletin 25, Geological Survey of Western Australia, Perth, Australia, 306 pp. [Jaspillite] Cornejo, C. and Bartorelli, A., 2010, Minerals and Precious Stones of Brazil. British Columbia Geological Survey, Minfile database. Pan, Y., Fleet, M. E., Barnett, R. L., & Chen, Y. (1993). Pyrosmalite in Canadian Precambrian sulfide deposits; mineral chemistry, petrogenesis and significance. The Canadian Mineralogist, 31(3), 695-710. [Jaspillite] Bennett G. (1978) Geology of the Northeast Temagami Area, Ontario Geological Survey, Report 163, p.82. [Banded-ferruginous chert] Vos, M. A., 1976, Amethyst Deposits of Ontario, Ontario Division of Mines, pp. 99..
[Jaspillite] Miller, Willet G. (1910): The Cobalt-Nickel Arsenides and Silver Deposits of Temiskaming (Cobalt and Adjacent Areas); Ontario Bureau of Mines, Vol. 19, pt.2, p. 57. B.H. Ali, M.G. El-Feky, M.A. Ali and E.K. Abu Zeid, (2008) Mineralogical and Fluid Inclusions Studies on the Mineralized Bostonite Dykes at UM Guruf Area, Central Eastern Desert, Egypt. Asian Journal of Applied Sciences, 1: 158-167. [itabirite] Kondja, S.J., Ondo, S.M.N., Minko, A.E., Mikolo, F.M. (2017) The Bélinga Iron Ore Deposit (~2.8 Ga), NE-Gabon: Reactualization and New Interpretations on Crests. European Scientific Journal 13:24, 307-321. Schwartz, M. O. (1990). The strata-bound tin deposit Nam Salu, Kelapa Kampit, Indonesia. Economic Geology, 85(1), 76-98. Ahmedou, O. A. (2011). 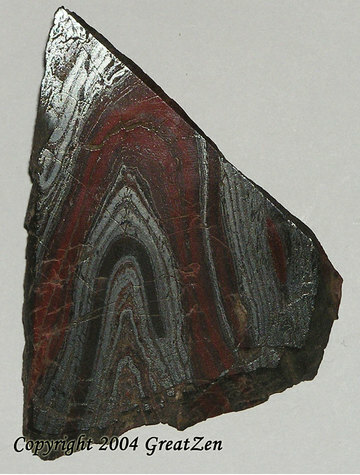 Contribution à l'étude géologique et géologique des minéralisations ferrifères de type banded iron formations (bif) des formations protérozoïques de la Kediat d'Idjil, cas du gisement de F'derick, dorsale regimbât occidentale (Mauritanie septentrionale) (Doctoral dissertation). Taylor, C. D., Finn, C. A., Anderson, E. D., Bradley, D. C., Joud, M. Y., Mohamed, A. T., & Horton, J. D. (2016). The F’derik-Zouérate Iron District: Mesoarchean and Paleoproterozoic Iron Formation of the Tiris Complex, Islamic Republic of Mauritania. In Mineral Deposits of North Africa (pp. 529-573). Springer, Cham. [Jaspillite] Belykh, V.I., Dunai, E.I., and Lugovaya, I.P. (2007): Physicochemical Formation Conditions of Banded Iron Formations and High-Grade Iron Ores in the Region of the Kursk Magnetic Anomaly: Evidence from Isotopic Data. Geology of Ore Deposits 49(2), 147-159. Siemes, H. (2013). Microstructure and Crystallographic Preferred Orientation (CPO) of Hematite Ores from the Sishen Mine, Northern Cape Province, South Africa. South African Journal of Geology, 116(1), 79-100. Mbonimpa, A. (2005). The genesis and characteristics of the gold mineralisation in the area between river Malaba and river Solo in Busia district, South Eastern Uganda (MSc thesis, Makerere University). [Jaspillite] Pavel M. Kartashov data; Baranov, P., Shevchenko, S., Heflik, W., Natkaniec-Nowak, L., & Dumanska-Slowik, M. (2009). Jaspilite—the gemstone of Ukraine. The journal of gemmology and proceedings of the Gemmological Association of Great Britain, 31(5), 163.; Mboudou, G. M. M., Lordon, A. E. D., & Mafany, G. T. (2013). Combined statistics, Petrography and Geochemistry for the definition of ore types in Krivoy Rog Iron Province (Ukraine). Sci. Technol. Dev., 14, 25-34. [Banded-ferruginous chert] USGS (2005) Mineral Resources Data System: U.S. Geological Survey, Reston, Virginia. [Jaspillite] Morrill & Chaffee, 1960. Vt Mines & Mineral Localities, Part II. Dutton, C. (1983) Lithology and geological setting of Lower Proterozoic iron formations in parts of northern Wisconsin: U.S. Geological Survey Open File Report 84-76, 15 p.
Brown, B. (editor) 1983, Three billion years of geology: a field trip through the Archean, Proterozoic, Paleozoic and Pleistocene geology of the Black River Falls area of Wisconsin: Wisconsin Geological and Natural History Survey, Field trip Guidebook 9, 51 p.
Kimball, K & F. Spear (1984) Metamorphic Petrology of the Jackson County Iron Formation, Wisconsin, Canadian Mineralogist: 22: 605-619. Oberthuer, T., Saager, R., & Tomschi, H. P. (1990). 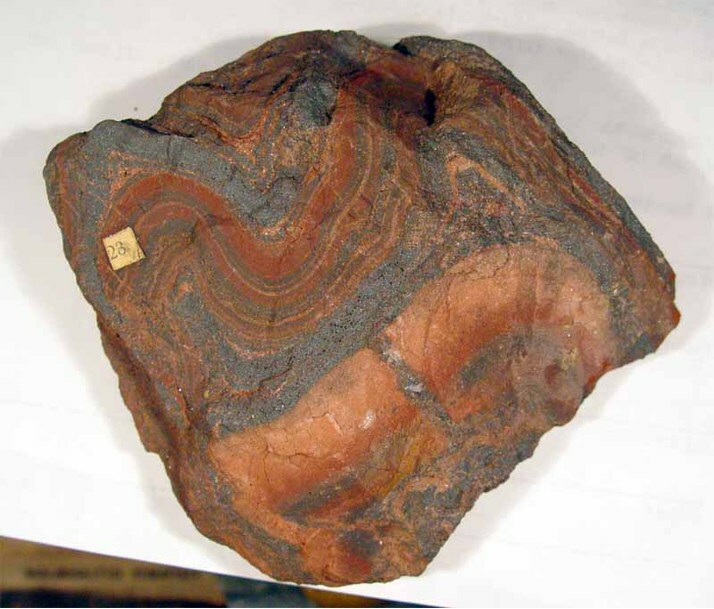 Geological, mineralogical and geochemical aspects of Archean banded iron-formation-hosted gold deposits: Some examples from southern Africa. Mineralium Deposita, 25, S125-S135.